Sierra Gate Homes Wins Ottawa Citizen People's Choice Award! The 33rd annual Greater Ottawa Home Builders’ Association (GOHBA) Housing Design Award winners were announced at a gala event at the Rogers Centre in Ottawa on Saturday, October 22, 2016. Sierra Gate Homes was thrilled to take home the night’s top honour – the coveted Ottawa Citizen People’s Choice Award! Our modern infill on Daniel Avenue in Westboro was one of 179 finalist projects vying for this award. We were competing against the best of the best in Ottawa’s residential construction community. This award is therefore a tremendous honour! We would like to sincerely thank everyone who voted for us – our clients, trades and suppliers, and everyone else who liked our project. We are excited to be breaking ground on two infill projects in Westboro in 2017. 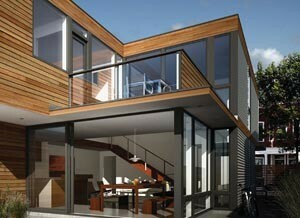 And we look forward to joining our peers again at next year’s Housing Design Awards! Sierra Gate Homes is proud to be a finalist in the 2016 Greater Ottawa Home Builders’ Association (GOHBA) Housing Design Awards! 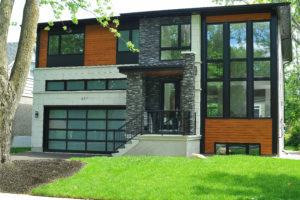 Our new custom modern build at 231 Daniel Avenue in Westboro has been selected in the Custom Urban Home (2,401 – 3,500 square feet) – Contemporary category. Sierra Gate Homes is proud to announce completion of our latest Westboro project! This 3,200 square foot contemporary modern home at 231 Daniel Avenue boasts a bright, open-concept design, modern finishings, a fully finished basement and a double garage. Situated in a quiet neighbourhood of mature trees, this home is just minutes from the bustle of Westboro. Click here to learn more about our Daniel Avenue project! We are now working on our next project. Like our build at 231 Daniel Avenue, this next home will incorporate a range of green construction practices that optimize energy efficiency and exceed building code requirements. Stay tuned for updates! Sierra Gate Homes has broken ground on its latest project – a 3,200 square foot modern home at 231 Daniel Avenue. The project is just blocks from popular shops and restaurants in the heart of the established Westboro neighbourhood. Designed by Miroca Designs, this two-storey home features open-concept living areas graced by expansive window walls. Selected finishes and features are of the utmost quality and meet the highest of design standards. Minutes from the town of Barry’s Bay, Algonquin Shores features twenty-five forested recreational-residential lots surrounded by a chain of four interconnecting lakes. Only fourteen lots remain. One has over 100 feet of shoreline and the other thirteen have access to Trout Lake. 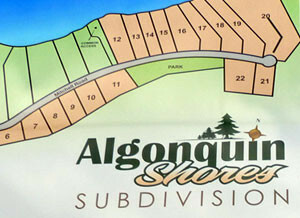 Algonquin Shores is ideally situated between Ottawa and Toronto, just east of Algonquin Park. The peace and serenity of Algonquin Shores is perfect for a summer getaway or a year-round home, with opportunities for fishing, boating, hiking and winter sports right on your doorstep. Lindal Cedar Homes and Sierra Gate Homes are proud to partner with Algonquin Shores. Please contact us for more information! 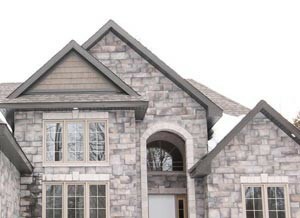 In September, 2013, Sierra Gate Homes began managing construction of a stunning 2,000-square-foot Lindal home in Vankleek Hill, Ontario. This Lake Vista Prow Star, one of Lindal’s classic models, features a dramatic great room with expansive window walls, and an open kitchen, family room and dining room that create a mix of inviting spaces for relaxing and entertaining. The entire second floor is devoted to the master suite. 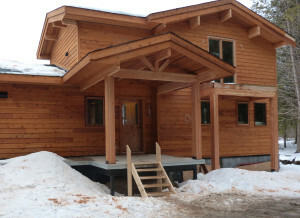 This homeowner opted to finish the interior with cedar liner on the ceilings and some walls. This gives the home rustic appeal. The photos in our gallery walk you through the entire building process, from delivery of the package to final completion. 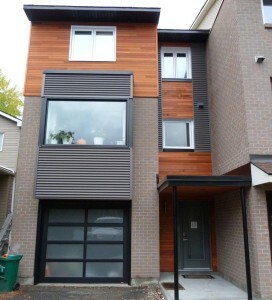 We recently completed renovation of a townhouse in the Westboro neighbourhood of Ottawa. Built in the 1980s, its exterior facade was dated. The homeowners provided us with plans for a refreshing and modern new look. We achieved this look with a combination of cedar siding, corrugated metal and a California-style garage door. 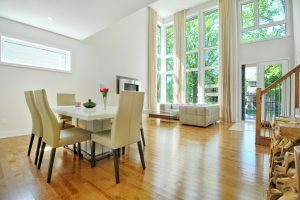 A couple approached us about renovating the interior of their townhouse in Ottawa’s Westboro neighbourhood. They had purchased the townhouse as an investment rental property and needed to give the outdated interior a bold new look. We provided them with a new paint job on both floors, installed bamboo hardwood flooring on the main level, and put down new carpeting throughout the upstairs. We also installed a new modern kitchen with stainless steel countertops, and refinished the fireplace with cultured stone. 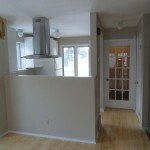 The end result was a fresh, modern townhouse with an inviting new look! We built a model home on a quiet country road in Spencerville (south of Kemptville) in 2012. This graceful 1,700-square-foot bungalow was a testament to the superior quality workmanship upon which we pride ourselves at Sierra Gate Homes. It featured a floor-to-ceiling stone fireplace and vaulted ceilings in the great room, a 14-foot exterior entrance, and 14-foot ceilings in the main entrance and dining room. The ensuite offered spa-like comfort with a glass and tile shower enclosure, raindrop shower head, pot lights and separate Roman tub. All bedrooms included a walk-in closet. The kitchen featured maple custom cabinetry. The flooring was maple hardwood throughout the main living area, and ceramic tile in the entrance, kitchen, ensuite and main bath. Our model attracted a great deal of interest from buyers seeking luxury, comfort and quality in a rural setting. Sierra Gate Homes is breaking ground on four new custom home projects! We have partnered once again with DevelUp Real Estate Development to create stunning two-storey contemporary modern homes with footprints of between 2,700 and 4,500 square feet. Two of these homes are located in Westboro at the corner of Byron and Broadview, and two are on Fox Crescent just off of Woodroffe Avenue. As with all projects by Sierra Gate Homes, these four homes will have expansive walls of windows, open-concept living areas, and finishings and design features from Ottawa’s leading designers and suppliers. And, like all of our projects, they are being built to promote healthy and sustainable lifestyles. All four homes will incorporate a range of green construction practices that optimise energy efficiency and exceed building code requirements. The first of these four projects – 453 Broadview Avenue – is slated for completion in December, 2017, with the other three closing in early 2018. Meanwhile, our schedule for 2018 is filling up with new custom home projects. We’ll keep you posted! Lindal’s live and interactive webinars provide a wealth of invaluable information about the Lindal Experience. If you are in the process of planning your dream home, a one-hour Lindal webinar is an extremely valuable investment of your time.